Richmond has plenty of expansive green spaces to dive into when you need a nature fix. 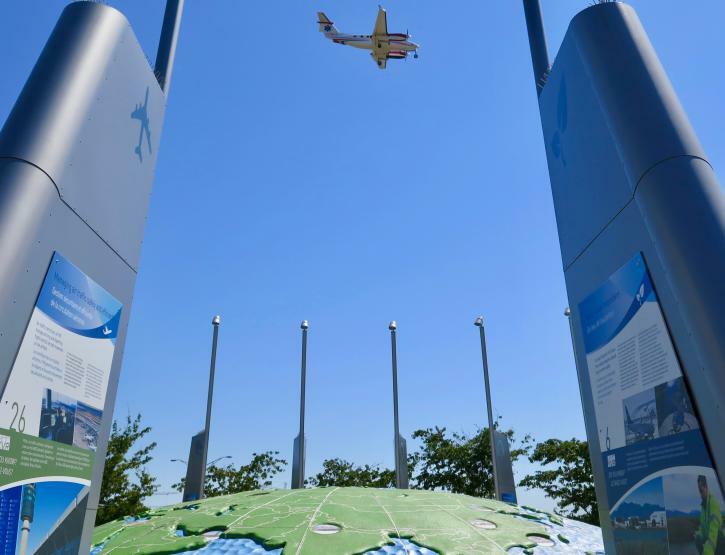 But the city’s most unusual small park has a quite a different appeal—especially if you have an interest in what’s happening over at Vancouver International Airport (YVR). Larry Berg Flight Path Park is an intriguing outdoor area tucked just beyond the perimeter fence at the end of YVR’s busy south runway. And while plane spotters have been gathering here with their binoculars since opening day in 2013, the unique pocket-sized park is also worth visiting for anyone with some time and curiosity to spare. 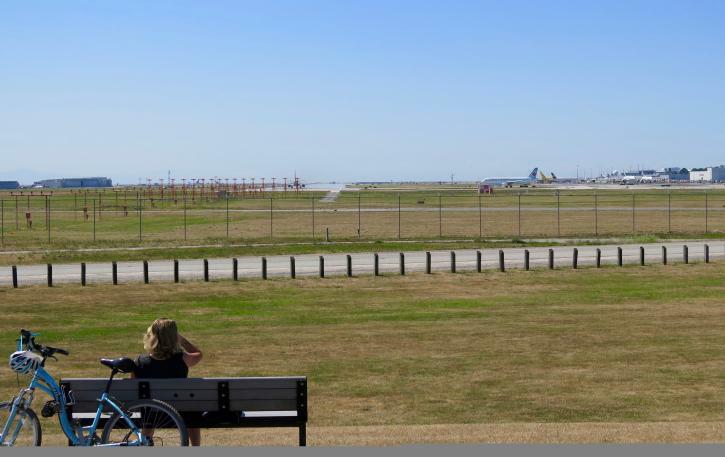 Sandwiched between Russ Baker Way and Airport Road, the triangular green space—named after a retired YVR president and CEO—is the perfect place to picnic and watch the planes roaring overhead and landing just in front of you. There are lots of view-hugging picnic tables and park benches here, including some shaped like oversized paper planes. 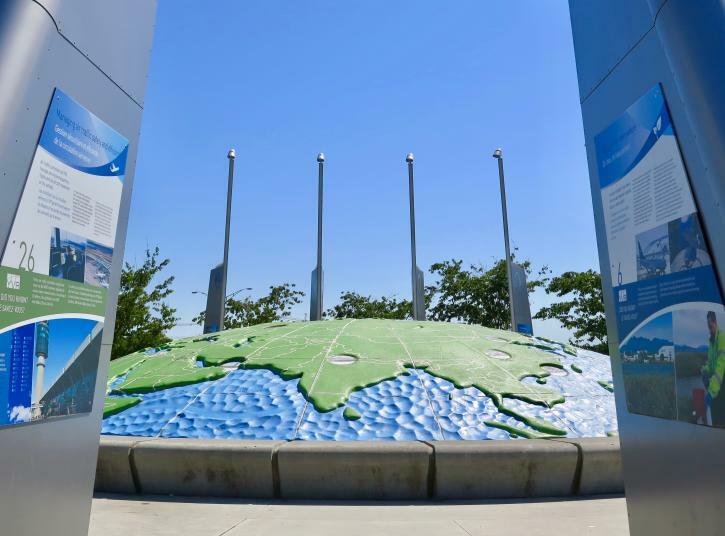 There are also lots of aviation-themed information panels to peruse, plus some excellent kid-friendly features that make this a great park for families to check out. And if you’ve arrived early for a flight or an airport pick-up—or you just fancy catching an amazing sunset over the runways—this is also a cool pit stop to pull into. On a small landscaped hill in the middle of the grassy park, there’s a paved area lined with graphic information panels. Tapping your inner plane spotter, these show you exactly how to identify many of the aircraft that regularly pass overhead here. You’ll quickly learn the difference between an Embraer ERJ-190 and an Airbus A340-330s, while also discovering how to spot the distinctive T-shaped tail of a De Havilland Canada DHC-8-400. If you’re lucky, you might even spot an enormous, four-bladed Sikorsky 76 helicopter flying past. The park’s most prominent feature, though, is the dome-shaped top section of an enormous globe. Showing the locations of cities from Manila to Addis Ababa to Auckland, its textured curved surface encourages you to climb aboard and stand right on top of the world. The globe is the park’s most popular photo opportunity. But it’s also worth checking out the circular information panels dotting its surface. You’ll learn just how far you need to fly from YVR to reach specific destinations around the world: it’s 7,504km to Tokyo, 8,151km to Lima and a whopping 12,499km to Sydney, for example. Luckily, you&apos;ll be much closer to the park’s other family-friendly attractions. 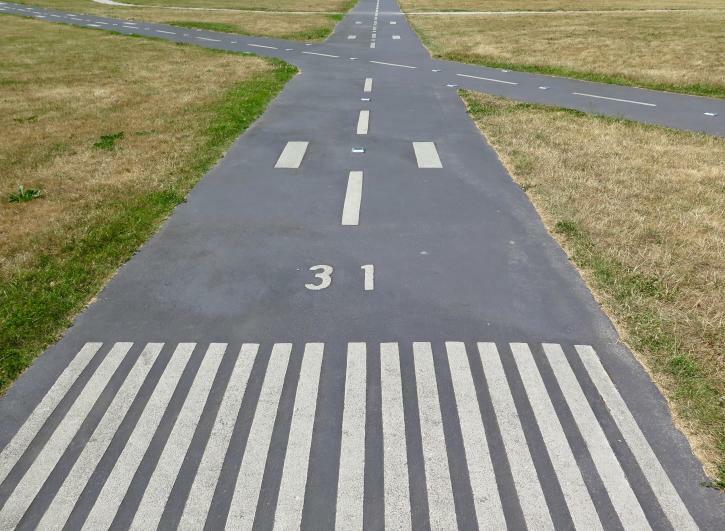 Aside from clambering across the globe—a must-do for most junior visitors—the area is also striped with mini-runways that look exactly as if a small plane might land on them at any moment. Meticulously created with authentic markings and real runway lights, kids of a certain age love riding their bikes on these smooth pathways. Older kids and adults should also check out the 10 wing-shaped information panels arranged in a circle around the globe. These explain everything from Vancouver International Airport’s air traffic control facilities to the technical aspects of radar. There’s also some fascinating information—and evocative photos—illuminating the early days of the airport. Opened in 1931, the project to build YVR was started soon after legendary aviator Charles Lindbergh had publicly criticized Vancouver for having “no fit field to land on.” Fast-forward almost a century and the airport now serves more than 55 airlines and 22 million passengers a year, making it Canada’s second-busiest airport. Larry Berg Flight Path Park is located near the intersection of Russ Baker Way and Airport Road. Accessible by car and bike, you can also get here on transit: the C92 bus from Bridgeport Canada Line Station stops at the British Columbia Institute of Technology building across the street; it’s a five-minute walk from there, via a grassy field, to the park.